On the surface, a lot of alternative rock grooves can sound seemingly basic. If you start scrutinizing them, however, you’ll realize there is a lot going on. In fact, for a genre where musical prowess often is downplayed in favor of artistic expression, there is much to be attributed to the players. Essentially, keeping it simple is hard – especially when it comes to the drums. "When researching this MIDI pack and digging through a virtually bottomless well of songs of the genre, what I realized was how much the smallest details actually add to the bigger picture. Even though subtle, every ghost note and accent play a pivotal role in each groove. As a drummer, coming up with ideas for this package was a real eye-opener," says drummer Paul Szlachta. 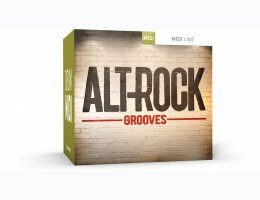 The Alt-Rock Grooves MIDI pack presents a comprehensive collection of fundamental beats and fills inspired by some of the most influential artists of the genre: Nirvana, Soundgarden, PJ Harvey, Smashing Pumpkins and many others. The material is based around basic and staple-type grooves but with a clear emphasis on detail, variation and dynamics. While the dramaturgy of dynamics is vital in any kind of music, perhaps it’s most blatantly so in alternative rock. The soft-hard formula of a laid back verse leading into an explosive chorus has proven a winning concept in not many, but numerous groundbreaking tracks. "While recording this collection of grooves, I’ve come to reevaluate my take on the profound role that the drums play in seemingly simple alt-rock compositions." - says producer Michael Sanfilipp. Drum grooves and fills inspired by alternative rock music. More than 420 individually played files. 4/4 and 6/8 in straight feel. Tempos ranging from 75 to 160 BPM. Song structure categorization (intro, verse, chorus, bridge, fills, etc). A working version of EZKeys.